Naturally this week all the emphasis is on the ‘Battle of the Bogside’, the burning of Bombay Street by unionist mobs and the subsequent deployment of British troops on the streets of Derry and Belfast. Generally this sequence of events is taken as being the beginning of the Troubles. Few people know that about a fortnight before the Battle of the Bogside the RUC’s Belfast Commissioner requested that British troops be deployed against unionist mobs on the Shankill Road or that the first petrol bombs and blast bombs hurled at the RUC came not from the roofs of Rossville Flats in Derry but from rioting unionists in the lower Shankill. Ten days before the infamous Apprentice Boys march in Derry, the small Catholic enclave of Unity Flats was the target of a ferocious assault, according to the Scarman report, by crowds of up to 3,000 from the Shankill Road. Unity Flats was a 1960s development of 20 blocks of flats and two-storey maisonettes. In 1969 it comprised 200 dwellings housing about 1,000 men, women and children. It stretched from Peters Hill at the city end of the Shankill to Clifton Street. On Saturday August 2 1969 a Junior Orange parade was due to pass the flats on the way to catch a train to Bangor. Before the parade was due the footpaths at Unity Flats were filled by a mob led by the notorious John McKeague and the Shankill Defence Association he had formed in 1969. As soon as the Junior Orange had passed McKeague’s men surged towards Unity Flats. There appears to have been about a dozen police on duty at the entrances to the flats but according to residents these police joined the SDA mob in their attack. The residents held off the attackers, police and Shankill men, in desperate hand-to-hand fighting. A rumour had meanwhile spread that the Junior Orange parade had been attacked on its way past the flats with the result that crowds of people poured down the Shankill to await the parade’s return. Before that happened, shortly after 6pm according to the Scarman report, the crowd launched another assault on Unity Flats but were repelled by police. Other police were in the courtyards of the flats fighting with residents, one of whom, 61-year-old Patrick Corry, subsequently died from his injuries - three skull fractures. Fighting continued until about 3am. 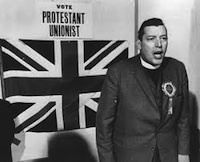 Later that morning, Sunday, a unionist mob, 400 to 500 strong, regrouped at Unity Flats but were dispersed by 200 police and a Shorland armoured car. Again they regrouped and led by McKeague’s SDA behind a union jack marched down the Shankill. The police baton-charged them but the SDA built barricades and threw petrol bombs. The Shorland demolished the barricades. Then, incredibly, gelignite blast bombs were thrown at the police, who repeatedly baton-charged the mob, finally dispersing them about 1am, more than 12 hours after the rioting began. In the meantime the Scarman report records that at 4.45pm that Sunday the RUC’s Belfast Commissioner asked for British troops to be deployed because all RUC reserves had been committed. The CO of the only available troops, the Queen’s regiment, phoned brigade HQ in Lisburn but was told committing troops was a political decision that required approval from the secretary of state for defence in London, not Stormont. The Belfast police commissioner seems to have been ‘a bit previous’, as they say, because the RUC inspector-general did not support his request that Sunday. He told Scarman in rather incoherent terms he refused because of “the political angle that there were constitutional issues involved”. He was absolutely correct. It raised the question of who would be in charge of British troops. Sadly when they were deployed 10 days later it was to support the failed unionist junta at Stormont. It would be another two-and-a-half years before the British followed the logic of their actions and swept the unionists aside. By then the damage had been done. How interesting it would have been if troops had been sent in because Stormont couldn’t control the instigators of violence in 1969, their own unionist wild men, rather than to deal with what Stormont ministers could characterise as a republican insurrection.